Standing in front of your heater might quickly warm you up, but put a jumper on and you’ll save more. MILLIONS of Australian households leave their heaters and airconditioning on when they're not at home. And it's costing the country billions of dollars. While the average Australian household spends $920 a year heating and cooling, for those who leave their systems on when they're not at home - this figure rises to a whopping $1540 per year. That's right, by forgetting to turn off your heater or aircon, you're wasting $620. Figures provided to news.com.au by Finder.com.au show 23 per cent of households leave their aircon on when nobody is there. The figure is reduced in winter to 7 per cent of households leaving their heaters on. ABS Census figures from 2016 show there were around 8.29 million households in Australia, so that's a lot of homes running heaters or airconditioning. Even leaving your heater on for three additional hours a day can up your quarterly bill by $201. 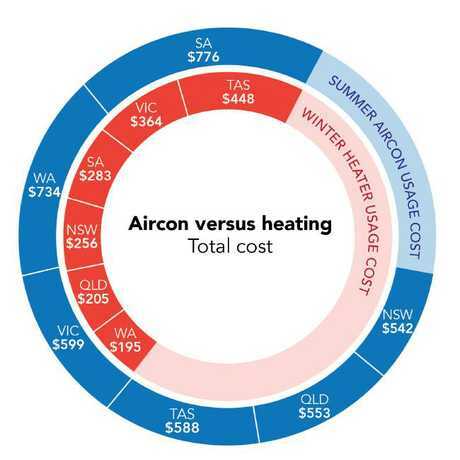 Finder told News.com.au that Aussies used heating and cooling in equal measures, but airconditioning costs a lot more, accounting for $628 in summer. Tasmania came in top spot for worst offenders for leaving the heating on when not at home, with 28 per cent owning up to it, followed by Victoria at 12 per cent. Queenslanders living in a warm climate were the least likely to leave their heater on when they're not home - with only 2 per cent doing it. In summer surprisingly it's not the Queenslanders who are wasting the aircon: Victorians and South Australians are the worst offenders. They're tied in top spot at 26 per cent using aircon when not at home. Bottom of the rung was again Queensland, despite the warm weather. 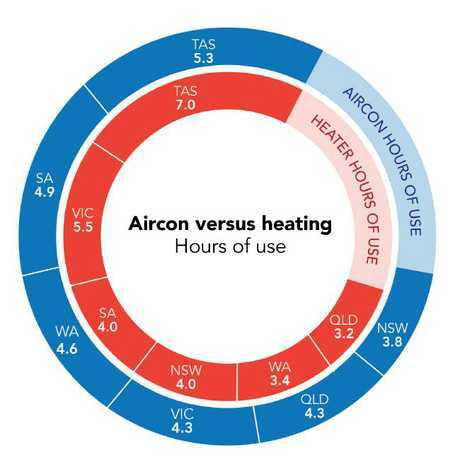 Tasmanians are the biggest consumer of both heating and cooling nationally, using 5.3 hours of aircon in summer and 7 hours of heating in winter. Queensland residents came in lowest for heating - no surprises there - at 3.2 hours for winter. New South Wales residents were the most frugal users of airconditioning in summer at 3.8 hours. Australians are wasting far too much money by not turning off their heaters or air conditioners. Graham Cooke, energy expert at finder.com.au told News.com.au that Aussies now expected to live "in an era of comfort". 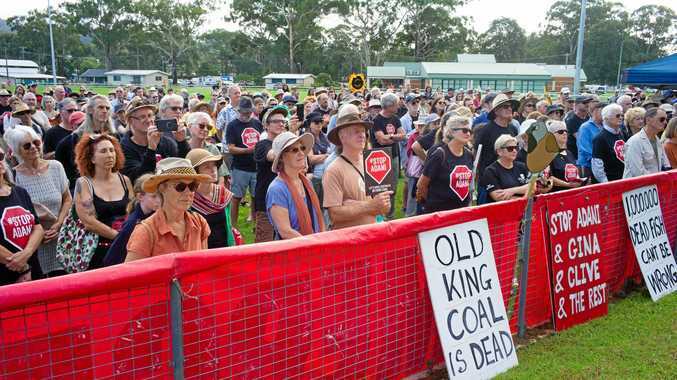 It's the norm to have cars, homes, schools, and shopping centres running heating or cooling, "no matter the cost to our hip pocket or the environment" he added. Mr Cooke said Australians should think about their energy bills before just switching on the heater. "There are a number of ways that you can stay warm without leaving yourself with a big bill at the end of winter," Mr Cooke said. "Sometimes popping on another layer or opting for an old fashioned hot water bottle can warm you up quicker than your heater." An hour of heating with a typical heater costs Aussies 70 cents, more than 1 cent a minute. This can quickly grow with multiple heaters or leaving heating on all night. A similar story is heard for split system airconditioning, which can cost as much as 2.7 cents a minute, or close to $13 a night. Energy Prices are at record highs, with heating and cooling responsible for 40 per cent of energy use, according to government figures, which makes our mistakes even more expensive. The actual cost of power fluctuates on a state-by-state basis too, which affects your bill, no matter how much you use. South Australia had the highest cost of keeping cool in summer, at $776, with an average use of 4.9 hours of aircon a day in summer. Western Australia was close behind, with expensive airconditioning, but thanks to balmy winters its residents don't shell out on heating. It's not just the basic climate that makes heating and cooling such and expensive outlay for many Aussies. Melbourne University's Professor Greg Foliente said Australian housing was, in one word, draughty. "It's really a big difference between how we build here and how we build in other countries," he said. "It's not in the tradition that we seal our buildings well. Especially residential." But he said sealing a building was the cheapest and easiest way to cut power bills on heating and cooling. Professor Foliente said even renters could cut their bills by using door snakes and keeping curtains shut to minimise heat transfer. • Add double-glazing and fix leaky seals around window panes.